The EMU continues to make growth progress and make progress in reducing the unemployment rate in the area. The EMU unemployment rate is down to its 2008 low. But bigger issue loom. Among the original EMU members, all except the Netherlands show unemployment rates that are falling over 12 months. All have unemployment rates falling over six months. And only two fail to have unemployment rates falling over three months; those two exceptions are tiny Luxembourg where the rate is unchanged over three months and Belgium where the rate is higher by 0.1% on balance. Both are minor exceptions to tsunami-like trends. The progress in the EMU is both solid and widespread. This is one time when the whole community seems to be on the same page in terms of changing economic conditions. Even Greece, with lagging data and the first country ‘in’ after the original euro-launch, demonstrates these same group properties of falling rates of unemployment hold across horizons. However, in terms of the levels of unemployment, the differences are huge. The dispersion in the level of unemployment rates among members has been falling. Currently, the dispersion has a ranking in its 43rd percentile since 2002 (below its median which occurs at the 50th percentile). And the dispersion in unemployment rates among EMU members continues to fall from its peak around 2013. While the changes in unemployment seem to be progressing and coursing through the entire EMU system, the impact on local unemployment rate levels is still quite varied. Austria, Italy and Luxembourg still have unemployment rates above their respective medians on data back to 1991. Of course, on lagging data, Greece is above its median as well. A series of countries are at about the same percentile standing in their respective 30th to 40th percentiles; these are Finland, France, Spain, Ireland, and Portugal. The Netherlands has a standing at its 19th percentile which is also about the EMU wide (weighted) average. Belgium has the sixth lowest rate of unemployment in the EMU (among early members), but it has the second-lowest relative standing for its rate at its 3.2 percentage point mark (Belgian unemployment has been lower only 3.2 percent of the time). Only Germany, with a 0.3% standing on its unemployment rate, has a standing lower than Belgium and Germany has a post reunification low for its unemployment rate. The extremely low rate for Germany, coupled with Germany’s huge population size, is responsible for making the overall EMU unemployment rate so low. Only three countries have country level unemployment rates at the same or lower mark than the EMU wide level while eight have higher rates. Germany’s performance tends to dominate the EMU statistics. Meanwhile, inflation continues to run well below the target pace for it according to the EMU mandate (of just under 2%). And as we saw with unemployment, also for inflation, there are huge differences among the prevailing year-over-year rates of inflation by country in the EMU. Austria has the highest inflation at 1.9%, still compatible with the EMU target. Belgium, France, the Netherlands, Germany, and Spain all have rates in the 1.2% to 1.4% range. Luxembourg has inflation at 1%. Portugal is at 0.7%. After that, all the rates are at 0.5% or less: Ireland, Italy, Finland and Greece. The fact that unemployment is falling all throughout the EMU is not enough to allow the ECB with confidence to make one policy for all. Not only is there still great variation in the unemployment rate throughout the EMU, there is also substantial variation in local rates of inflation for the targeted measure and inconsistent inflation/unemployment pairings. For now the ECB is planning for the future. It is preparing for the time when inflation will be more normal. It has scaled back on its warnings and statements of preparedness to do more and announced retraction for lending programs. It is preparing for normalcy. And that all makes sense since the EMU and its membership, by and large, appear to be headed for normalcy. But it is still not clear how much uniformity will take hold in the future. Everyone is headed for the ‘future,’ but they are not all going at the same speed nor will they all reach the same destination. 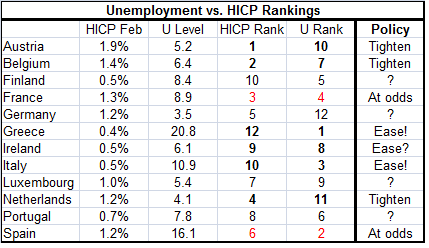 When we look at individual countries in the inflation/unemployment space, we see myriad policy conflicts. Several countries are in positions in which the policy choice is unclear. But a number are in policy zones that are quite clear but in conflict with their neighbors’ zone! France, for example, has inflation relatively high at 1.3%, but unemployment is relatively high as well as 8.9%. French inflation is the third highest in the euro area as its unemployment ranks as the fourth highest. So it should...? In all these cases the judgements are nothing more than that. For example I put a question mark by Germany. But if Germans were making policy and if the Bundesbank were in control, Germany would raise its rates now. Inflation is not high in Germany, but unemployment is so low that Germany would be preparing for the future. But stuck in the euro area, policy cannot and will not be made for Germany on German preferences. Greece’s circumstance calls for easing with the highest rate of unemployment in the EMU and the lowest inflation! This is clear cut. But that is not going to happen either. The euro area continues to be plagued by the problems of heterogeneity. Ultimately, this was the reason that the U.K. opted out. EU rules spread into more areas and eventually touched nerves too sensitive for U.K. citizens to tolerate. Had U.K. officials not promised a referendum they probably would have sucked it up and withstood the criticism back home, the way the rest of Europe is doing. But instead a vote had been promised and when it was concluded Brexit was the new plan. I think that the EU and EMU need to find a way to live in peace with its members and with their citizens. The days of hard-fisted centralized control are over. The rambunctious Five-Star movement in Italy, Podemos, and the mixed desires Catalan’s to be their own bosses have exposed a raw nerve of discontent in the EMU. Even Germany has political unrest and Angela Merkel is back in charge but of a coalition she no longer dominates. Is the EU solution really to not let ‘the people’ vote or express themselves on important issues? Is that a plan that can stand the test of time? 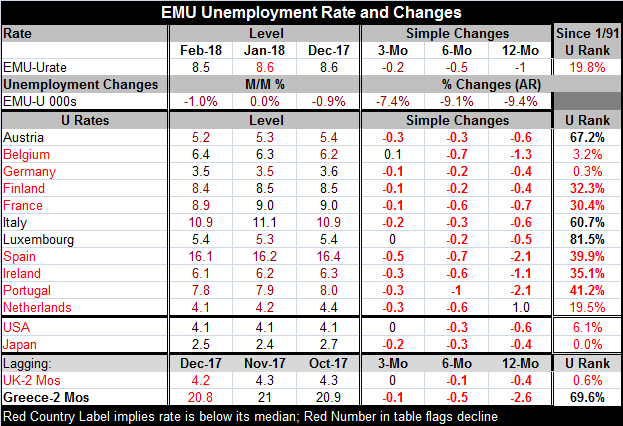 Even the data in the tables show that after 28 years of ‘progress’ huge economic differences remain that allow unemployment rates to be very different across the EMU and inflation rates to be very different within the EMU community. Of course, if we segmented the U.S., we would find some of the same features present. No region is completely integrated and changes in the U.S. over the last decade have probably led to their being more regional disparity there instead of less. Still, in Europe there are nationalistic identities, local language differences, obvious differences in customs, no common fiscal policy to smooth over uneven economic pot-holes and ‘EU membership’ can only shove so much of that in can and seal the lid. At the end of the day, you can line all the cans up on a shelf or two and label one EU and the other EMU, but there are still different pressures at work in each can. I don’t think that the EU-EMU have found the right mix of stable and acceptable policies yet. The U.K. was busted out of EMU on the immigrant problem; its desire to control its borders left it with no other choice. Germany is protected, sitting in the middle of the EMU. It has a buffer zone now. Italy and Greece do not. Guess where the problems are piling up? The EU has rules, but it has no mechanism to enforce its ‘common border’ or to share the cost. That border is a patch job of national actions and policies. When the crisis was at its worst and Italy and Greece were being inundated, a Belgian minister told them to push the migrants back into the sea. Nice policy choice. All I have done above is to document how economic circumstances are at logger heads even when on the surface it seems that everything is working so well. In fact, if you dig deeper, not very much is working very well in Europe. And with Donald Trump pushing for trade fairness, more policies in Europe are going to come under pressure and scrutiny. France is undergoing strikes because the French do not like Macron’s labor market modernization. The French want to remain France they all knew. They like their protections. But how will France continue to compete if it does not change? How will it compete even within the euro area? I think Europe is making a BIG Mistake by letting the U.K. go because it is imposing essentially social policies on members that the British find intrusive and so do other EU members and costs of this policy are falling disproportionately on member states and that is being ignored. The U.K. is out only because the U.K. had a referendum. In fact, most EU and members have a lot of domestic dissent over official EU policy toward migrants, but they have for now swallowed hard. Immigrants are piling into Italy at such a rate that that country may soon have to change its name. Greece is under the same pressure. On the economic front, Greece traditionally would be looking to cut rates. But that is not happening nor are Italy and Greece getting the financial or other support from fellow EU/EMU members in dealing with the ever expanding migrant problem. EU/EMU have steadfastly refused to engage in risk sharing. How can all this possibly end well? Denial is never a good policy option. EU and EMU need to come to grips with its economic divergences and its many social policy issues that have been ignored. Will it do so before something significant blows up in its face? I’m not sure that it will and the clock is ticking... or is that a bomb?